Oliver Wheelock has a new job. He’s loading mailbags, feeding homing pigeons, and doing whatever it takes to get Pan American Airways off the ground. It’s hard work, but it’s better than working at the hardware store . . . and maybe it’s his ticket to the life of adventure he longs for. When Pan Am’s ambitious owner recruits Charles Lindbergh—the world’s most celebrated aviator—it seems like a dream come true for Oliver. He finds himself working alongside one of his idols, the kind of man he has always dreamed of being. But Oliver soon learns the famous flyer is uncomfortable with his fame, and struggling with the adoration that greets him wherever he goes. 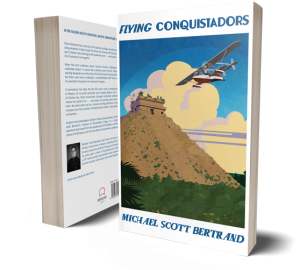 A promotional trip takes the Pan Am team—and a tempestuous young writer—to Mexico, for an aerial excursion over isolated Mayan ruins. At the fabled site of Chichen Itza, Oliver encounters Carnegie Institute archaeologists working to restore the ancient city . . . and meets an aspiring artist who begins to steal his heart. But what starts out as a mission to bring attention to the fledgling aviation company soon turns perilous, threatening the safety—and sanity—of Oliver and his companions. 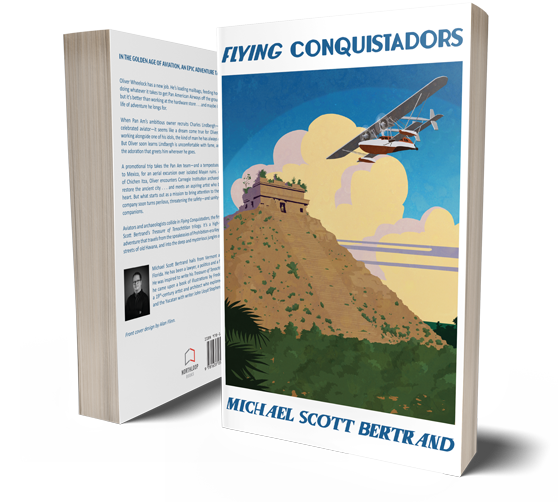 Aviators and archaeologists collide in Flying Conquistadors, the first entry in Michael Scott Bertrand’s Treasure of Tenochtitlan trilogy. It’s a high-flying, rip-roaring adventure that travels from the speakeasies of Prohibition-era Key West, through the streets of old Havana, and into the deep, mysterious jungles of Central America.